I am watching this guy build one out of a tiny garden shed. I think he is new to utube. check this guy out on building a new workshop if your space is limited. With a space that small I would have put hinges on the walls and made swing down props so you could add a "veranda" when working. BTW, instead of starting new threads about the same subject, just continue with the original post. My shop is even smaller. 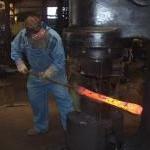 Nope he only tried cold work; not much of a blacksmith! A blacksmith CAN fix most computer problems by addressing the problem in *Old School* fashion. No electric or electric wires, and no batteries required. 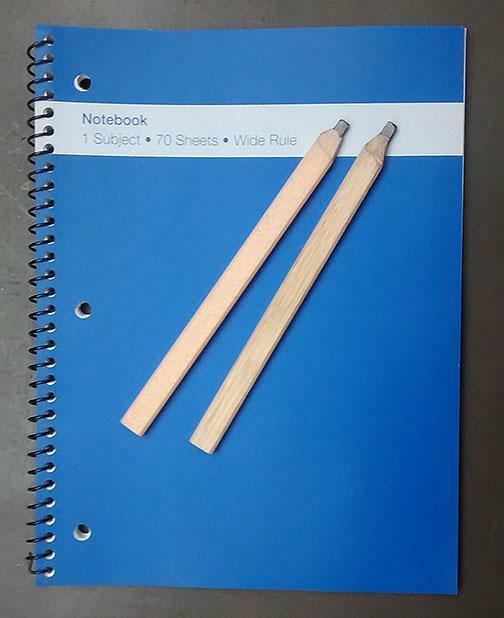 No deleted material as there are no erasers. Everything is automatically sorted in chronological order, just as it was entered. I got tired of sharpening pencils to a needle point so they could break when they touch the paper. Now use the flat pencils that you sharpen with a knife. I automatically go into SLEEP mode when I am not in the forge, does that count? I have repaired several computers using percussive maintenance. What do you guys think of this. Is this normal to do. I thought you would've maybe used rubber mat or something. just bolting down the anvil properly will eliminate nearly all the ring.. Ring is vibration and anvils vibrate a lot like a big tuning fork.. I've tried lag bolts in the past and they always loosened on me.. I used some 8" ones once and they also loosened.. I then switched over to the mountings I had shown somewhere else.. While most call it overkill I found it to be the best way..
Smithy 5 is up if anyone is interested. Check out this little Buffalo head hook that Peter has made. Did something like that back in the mid/late 1990's as a retirement gift for a co-worker who had a standing fishing contest with his fiancee; loser bought dinner every weekend. He, having lost multiple weeks in a row, needed an edge so I thought "larger tackle"; so I forged a fishhook and used 1" tygon tubing as the monofilament. In case that didn't work; I told him to switch the rules---and forged a 2' long "dry fly" out of much smaller stock and used a filament dusting wand for the hackle, 1/4" tygon tubing for it's monofilament. Check it out guys. 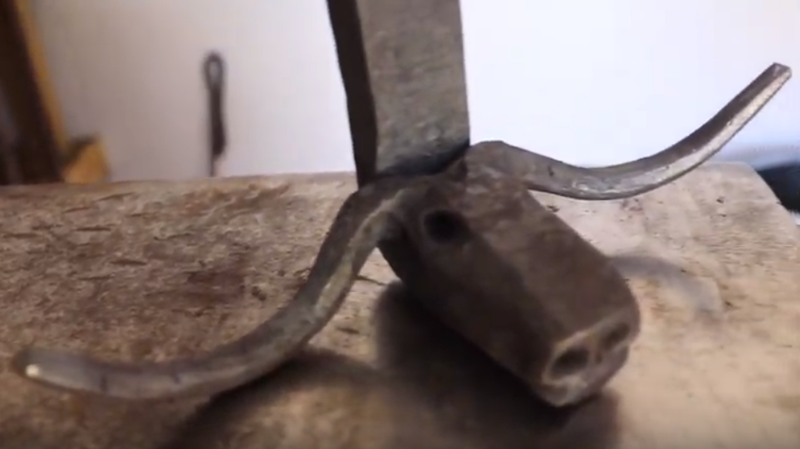 Hopefully this starts a lot of good information you can watch in the Blacksmith community. Pretty cool hey. I like this dude. ok cool. I find this forum a little hard to navigate. Huge how? Do you mean the anvil, or the mounts? the anvil is 175lbs.. 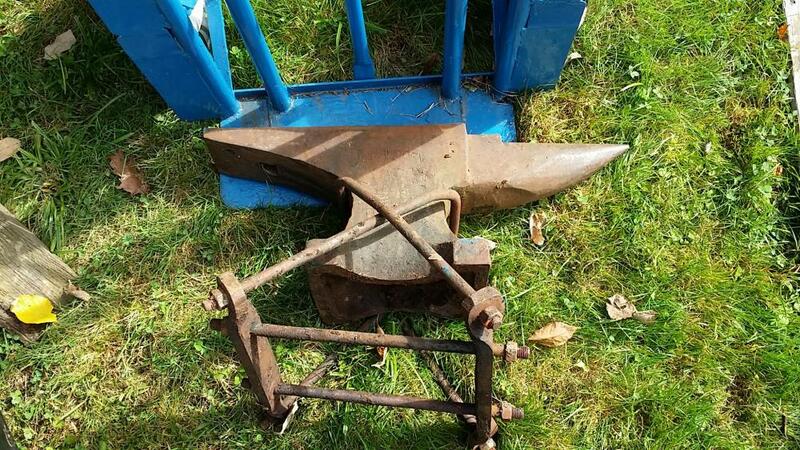 I like my anvils mounted solid.. No chance of movement is ideal for me.. been doing it that way for nearly 35 years.. Here is the setup from a different angle and the mounts once the block rotted away.. I find this forum a little hard to navigate. READ THIS FIRST and Table of Contents should help. I just thought I would share this with the community. I think it's pretty cool. I use Glen's method but in a non-volatile storage---I use a pen. Working in Software Engineering I tell the young engineers that's it's been all downhill since they made us stop using damp clay tablets and a reed! Share the best you have seen or made.